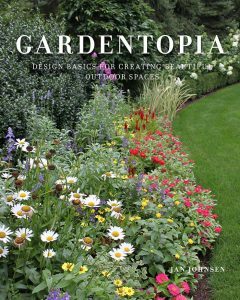 Gardentopia – Jan Johnsen’s new go to landscape book for Homeowners. A few years ago Ann and I were fortunate to interview Jan Johnsen about a fascinating book she had written about gardens. Jan is back with a new book “Gardentopia” for the home owner with 135 lushly illustrated garden and planting ideas that aim to inspire and inform you. They are fun, easy to remember and can be implemented in any size yard. Designed to help you with the process of accessing, sketching, designing, laying out and finally creating their own garden. Jan’s writing style allows the reader to follow the thinking process to such an extent that you are able to ‘join all the dots’ resulting in a much easier understanding of what can be quite a complex process. Jan’s extensive knowledge of plants for a purpose, shines through in the selection on plants she recommends in the closing chapters of this delightfully, inspiring and easy to read book.